Each application will have its own parameters that will influence the electrode material selected. Job parameters such as workmetal, cavity size, shape, and surface finish are all important, but achieving the desired results efficiently will depend on a good electrode to workmetal match. The EDM process is not affected by the hardness of the workmetal. The thermal properties of the metal determine its machinability by EDM. That is why the melting temperature of the workpiece metal plays an important part in how different grades of graphite perform. The following chart shows typical melting points for some common workmetals. Notice that tungsten carbide, one of the most difficult workmetals to cut, has a very high melting point. Tool Steel —Applications for this material include blanking dies and punches, master gauges, hobs for non-ferrous metals, drawing and forming dies, flanging dies, drill bushings, thread gauges, taps and reamers for non-ferrous metals. Stainless Steel — In the aircraft industry, it is used for parts such as compressor shrouds where oxidation resistance is required. Titanium Alloy— This versatile alloy is used in aircraft and jet engine parts, pressure vessels, rocket motor cases, marine parts and chemical processing equipment. Inconel — For high temperature applications requiring excellent corrosion resistance and strength. Used in jet engines and extrusion dies. Tungsten Carbide — Excellent for metal forming dies and punches. Aluminum— Ideal for prototype molds. The following chart is a good guide to selecting a classification of graphite materials for different workpiece metals. This chart can be used for general guidance in selecting a classification of material. Specific requirements of an application may require selection of an alternate material. The following chart is a guide for selecting the graphite electrode polarity to use with different workmetals. Some workmetals can be machined with electrodes in either polarity depending on the desired results (figure 8-1). *Negative polarity can be used when maximum speed is the only requirement. Figure 8-1. These two charts show the electrode wear and metal removal rate of two electrode materials. In the top chart, both electrode materials in positive polarity had the same metal removal rate and low wear. This would be ideal for a finishing operation. 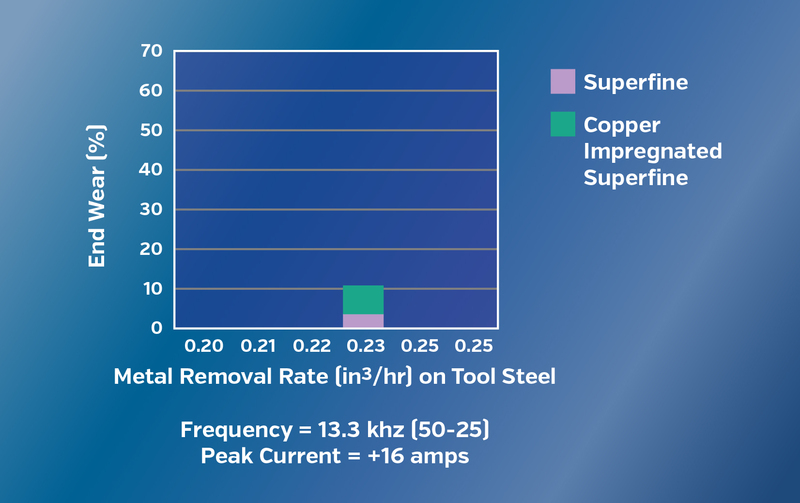 In the bottom chart, the electrodes are in negative polarity and the metal removal rate has doubled, but with increased wear. This would be ideal for a roughing situation where electrode wear is less important. Specific information can be found in the performance data charts that were produced by POCO's Objective Comparison Testing Program. They offer the best method of predicting the metal removal rate, wear resistance, and final surface finish obtained for a given electrode material/workmetal combination. These charts allow immediate comparison of MRR, EW, and SF at a variety of duty cycles and currents. Tungsten Carbide — To prevent this material from cracking, 15 amps is the maximum average current that should be used. 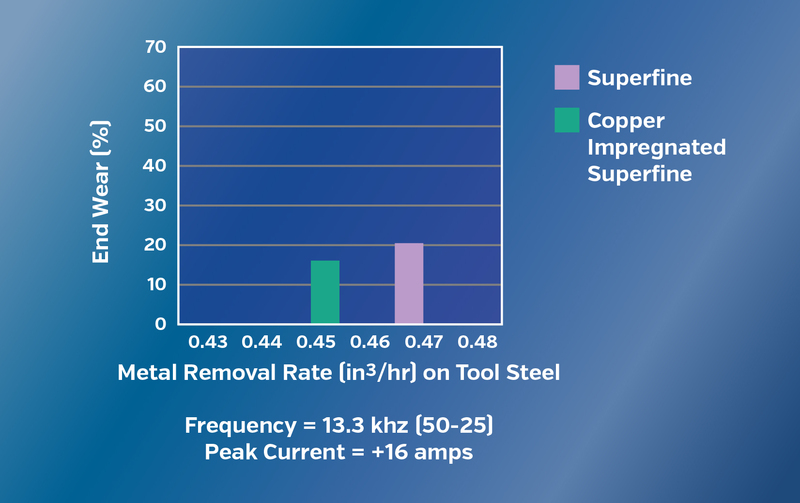 Copper Alloys — Use negative polarity and expect low MRR and high electrode wear. Aluminum — Although aluminum is easy to machine, it is hard to get a good surface finish. The block size of graphite is not a limiting factor when choosing a material. If the electrode requires a size larger than is currently available in the specific graphite grade needed, there are several techniques that can be used to fabricate a larger graphite electrode. Partial area or pieced electrodes can be fabricated by brazing, bonding, and/or simply mechanically attaching smaller graphite pieces to a backing plate, and can result in a very large electrode. As the amount of detail to be reproduced increases so should the quality of the electrode material. Angstrofine and Ultrafine materials will reproduce more detail with less electrode wear than the materials in the other classifications. The size and shape of the finished electrode is important in determining the maximum peak amperage (Ip) that can be applied to the electrode. A safe guideline is 50 amps per square inch. Excessive amperage can cause instability and DC arcing in the cut. Very small electrodes can be easily damaged by excessive amperage. The resulting peak current should be the maximum setting for that electrode. Large electrodes with protruding fine detail will have little of the electrode face starting the cut. The high amperage could damage the electrode before the cut becomes stabilized. Therefore the operator should seat the electrode at a lower peak current setting before increasing to maximum calculated peak current. This seating operation can be programmed into a CNC machine. Generally, the electrode is mounted on the ram head and the workpiece is mounted on the base, but the positions can be switched. It is important to remember that when discussing polarity it is always the polarity to the electrode, not the ram or the worktable. One of the many reasons to switch the location of the electrode and the workpiece is to improve flushing. Electrode position often depends on the particular application. Multiple parts can be mounted on tooling and loaded into the tool changer to increase the length of unattended operation. There are many applications where changing the electrode and workpiece location will improve the performance of the job (figure 8-2). There are a number of methods to fabricate electrodes. 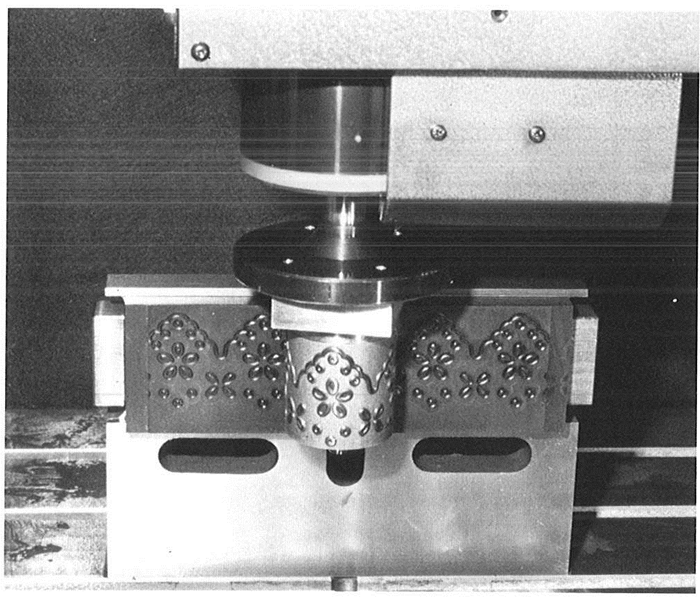 Traditional machining methods, wirecut EDM, abrading and ultrasonic methods are discussed in Chapter 10. The size and shape of the electrode along with the particular application are important considerations when choosing a fabrication method. Generally, a cavity cut on a manual machine without orbiting will require more electrodes than the same cavity cut on a CNC machine. Electrodes for unattended CNC EDM should be of the best material available for that particular job. The machine's ability to compensate for poor machining conditions caused by an inferior graphite will extend the machining time. A tool changing CNC EDM is of little use if you are constantly having to clear the gap or redress and replace electrodes before they have finished a particular operation.